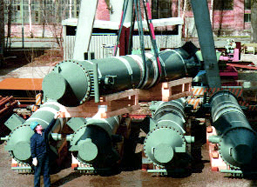 Since 1928, the BORSIG Group has manufactured scraped surface exchangers. An up-to-date, tailored-to-practice design, modern manufacturing and testing methods and the special know-how of its personnel ensures high-quality exchangers that meets all requirements with regards to stability, operational reliability and service life. The applications of the scraped surface exchanger range from dewaxing of lube oil, crystallization of paraxylene, de-oiling of wax, fatty acid service, producing of cellulose acetate flakes, continuous mixing of liquid and semi-solid products under cooling or heating, to heat transfer at major fouling of the transfer surface by the product and heat transfer at high viscosity of the product. The BORSIG Group supplies scraped surface exchangers for each required volume flow and thermal capacity of inner pipe dimensions of 6 inch, 8 inch, 10 inch, 12 inch and any other special size, as and when required.